Like most married couples, Chris and I have "agreements". You know, the usual...put down the toilet seat, sort the laundry into the appropriate basket, put the tools back where you found them, and if you are going to spend over $100, let's talk about it first. As a back story, prior to our move to Texas we decided to sell our piano since it's not the easiest item to move. So, it was sort of understood that once we got settled we could start looking for a new piano. I'm by no means a professional, but I enjoy challenging myself to learn new music and use the ivories as a sort of therapy - focusing on music forces me to stop focusing on all of the other worries a 20-something adult has. Our new house has an "office" which I like to call the "music room" with tall ceilings, chunky crown molding and beautiful windows...this meant my dream of a baby grand piano might be justified ;-) We went to the "piano" store, but just weren't ready to pull the trigger yet. So, we continued to scour Craigslist and found a couple of pianos to look at. Piano #1 was beautiful but the touch was stiff and I wasn't sure about the quality of the piece. Piano #2 was a Yamaha (great brand), and looked to be in immaculate shape, but it was twice as much as Piano #1 and 30 years older (1970's). I liked the touch and knew the quality of most Yamahas. We decided to have a piano technician give it a good look over before we made a decision. Chris was coordinating with the tech and told me he wasn't available until later the week after we looked at the piano. Well, he lied. 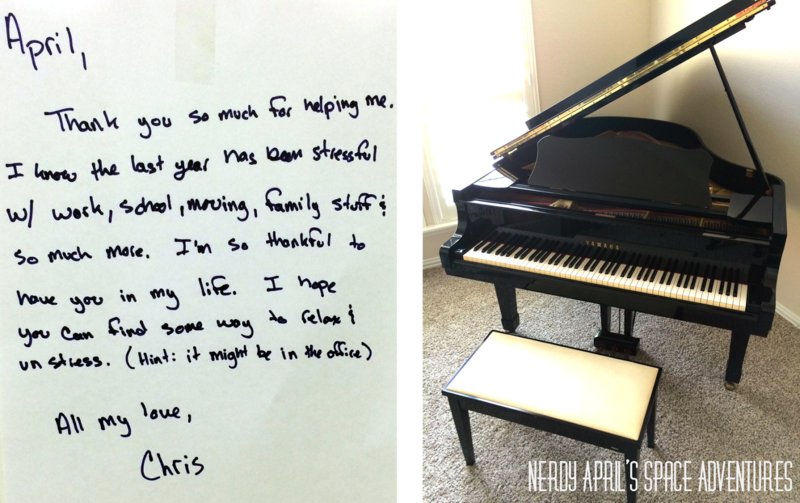 He coordinated with the tech that week and the tech told him the piano was in pristine condition. Yes, it needed to be tuned, but that is to be expected. He didn't tell me any of this. Instead he had the piano moved on Friday while I was at work and left the following note on the garage door. I walked into the office and had one of the most raw, gut-reactions. I absolutely broke down. All I could do was look at this impressive instrument sitting in MY house and just cry...tears of overwhelming joy. I finally called Chris after about 10 minutes of blubber-fest 2014. He said it was one of the best calls of his life. I played for about 4 hours that night, until my out-of-shape fingers were sore and achy. But it was so good. Music is so good. I am completely blessed - a beautiful husband, a beautiful house, a beautiful piano, and most of all, a beautiful life. This is SO COOL!!! What a thoughtful person!! Great story! You two sure are lucky to have each other. What a beautiful musical addition to your household. You two are so great for each other! What wonderful soul mates. That's wonderful! What a sweet guy!